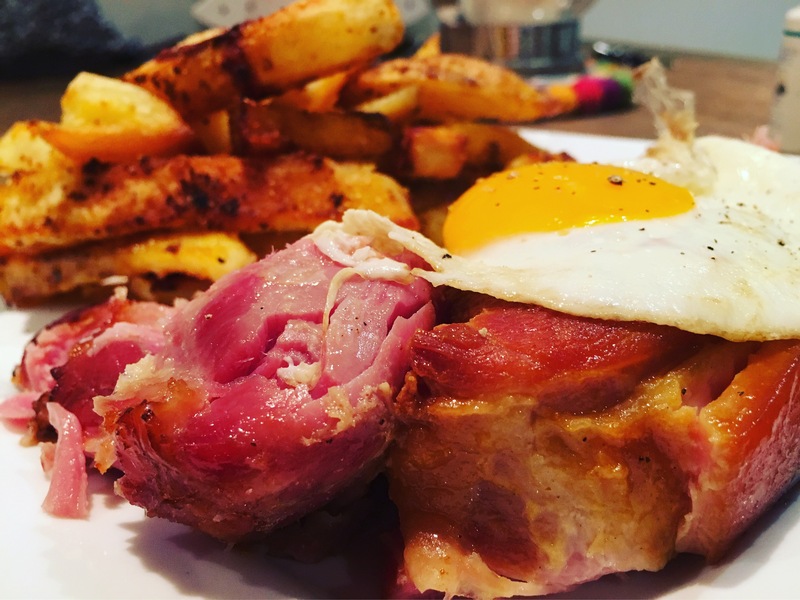 Ham egg and chips is a British classic. But mostly made with chewy Gammon steaks. Whenever I cook gammon I use a whole joint and slow cook it the way my Mum used to do it. Simply roasted in Honey and mustard. Then I make some home made chunky chips – to add a twist and not to everyone’s taste you can drizzle the chips towards the end of cooking with Marmite. It goes with Gammon really well. Cooking time around 4 hours. Goose fat or Sunflower oil for the chips. 1. Place the Gammon in a large saucepan and cover with water. 3. Place onto the hob and boil the ham for around an hour or so turning every now and again. 4. Once the ham has been boiled heat your oven to 180 Degrees. 5. Drain the ham and line a large casserole dish that has a lid with tin foil. 6. Place the ham in the casserole dish. 7. Drizzle over the mustard and honey. 8. Pour over a little olive oil and grind over some fresh black pepper. 9. Seal the foil over the top of the ham and place the casserole lid on top. 10. Place into the oven for 3 hours (checking every now and again, you’ll know when it’s nearly ready by pulling at it with 2 forks it should fall apart). About 15 minutes before serving remove the lid and open the foil to brown the top. 1. Around an hour before your ham is ready peel and cut up your chips. 2. Place into a saucepan, salt and boil till they just start to soften. 3. Heat a baking tray with the goose fat or oil in the oven till it’s spitting slightly. 4. Drain your potatoes in a colander, season with salt, pepper, paprika and sprinkle over the polenta or semolina (gives a nice crunchy bite) and maybe even chilli flakes. 5. Take the baking tray out of the oven and place the chips on to the heated oil baking tray, they should fizz and spit. Try to space them all out. 6. Place into the oven and cook until golden. 7. About 5 minutes before serving get a Teaspoon and drizzle over marmite and melt it in the oven. Carve the Gammon into thick steaks, plate up with chips and place an egg on each piece of gammon.